SO-CAL SPEED SHOP SACRAMENTO 1715 DEL PASO BLV. 1955-59 GM Pick-Up Truck Vintage Package. 1955-59 Chevy Truck Black Tach Force Package. 6 in One Package (Fuel 0-30OHM). 0-140 MPH, 0-8K, E-F, 0-100 PSI, 100-280F, 8-18V. Senders, hardware to mount in original dash included. This 1954-55 Chevy Truck package includes a 4 5/8" speedometer & 4 5/8" Quad gauge (240-33 ohm fuel, oil pressure, water temperature, & voltmeter). This package includes model specific polished alumium trim rings w/ LED turn signal & high beam indicators, mounting hardware, and all the necessary sending units. 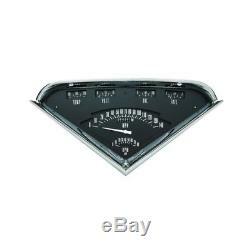 The item "1955-59 CHEVY GMC PICKUP TRUCK GAUGES w TACH ELECTRIC 12V HOT ROD CUSTOM RAT VTG" is in sale since Wednesday, May 2, 2018. This item is in the category "eBay Motors\Parts & Accessories\Vintage Car & Truck Parts\Gauges". The seller is "so-cal_speed_shop" and is located in Sacramento, California. This item can be shipped worldwide.